This Sunday we finally found out what motivates the Rickiest-Rick in the multiverse to take his grandson Morty on hilarious madcap adventures and it’s wonderfully mundane. 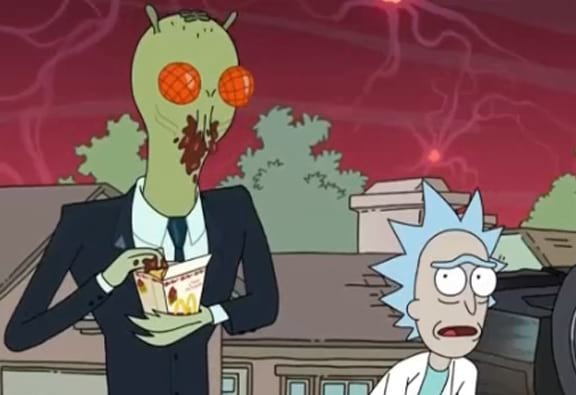 It turns out that the titular Rick from Rick and Morty isn’t motivated by the death of his original family or even some nihilistic philosophy based on the illusion of choice in an infinite multiverse, it’s all to do with McDonald’s dipping sauce. Szechuan McNugget sauce to be specific, which was launched to celebrate the release of Disney’s Mulan back in 1998. I’m not driven by avenging my dead family. I’m driven by finding that McNugget sauce. I want that ‘Mulan’ McNugget Sauce. … That’s my series arc, Morty. If it takes nine seasons, I want that McNugget Szechuan sauce. And while some fans are no doubt devastated to find out that Rick’s backstory is about as deep as a pot of McDonald’s sauce I personally think it’s brilliant and keeps Rick a hilariously enigmatic figure. It appears though that rick isn’t the only one who’s been missing the promotional plumb sauce, with fans starting a petition to bring back the delectable dipping sauce, a petition which currently stands at around 24,000 signatures. However if unlike Rick you aren’t willing to wait 9 Seasons and 97 years for the sauce some lovely chap online is offering a tutorial that’ll teach you how to whip up you very own McNugget Szechuan sauce. Of course if you’re too busy travelling the multiverse with your idiot grandkids to make your own sauce you’re in luck, there’s at least one dimension where McDonald’s may be bringing it back. This dimension to be specific, a dimension I’ve decided to label Dimension C-6167, why C-6167? Because I was the first one to name it so I get to choose the name. According to Business Insider a corporate chef at McDonald’s has already tweeted that he’ll see what he can do to get the sauce back in stores. Of course we have a got a live-action Mulan film coming out soon so it’s the perfect opportunity for Maccys to bring it back. Come on McDonald’s you could save Rick 9 seasons worth of effort!